Join us for the Homecoming Pep Rally Wednesday, October 17th, at 6:30 pm in the school gym. The grade with the most participants will have a class pizza party hosted by the cheerleaders! We hope you will join us decked out in your best hornet gear! Grace Gosserand and Justin Vosburg will represent Catholic of Pointe Coupee in the United States Senate Youth Program contest. Program requirements are involvement in school, elected or appointed positions or offices, and students must be actively serving in leadership positions. They will compete against other state nominees to represent Louisiana in the 57th Annual Washington Week, March 2-9, 2019. Grace is the daughter of Brandon and Brandy Gosserand of Ventress. Justin is the son of Chad and Jennifer Vosburg of New Roads. 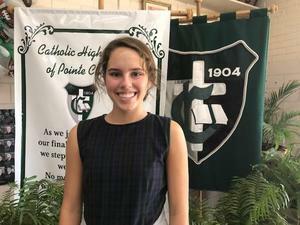 Julia LeJeune has been nominated to represent Catholic of Pointe Coupee for the 2019 Prudential Spirit of Community Award. Julia’s selection is in recognition of her exceptional volunteer efforts at school, church, and in her community. She will participate with other nominees to potentially be named as a State Honoree. Should she be chosen to represent Louisiana, she will go on to compete nationally for America’s top youth volunteers of the year. Julia is the daughter of Travis and Cathy LeJeune of Livonia. Kaleb McDowell and Jenna Smith have been recognized by Catholic of Pointe Coupee for being above average students academically, athletically, and possessing leadership qualities. They will complete on a state level with other nominees who have a cumulative GPA of 3.0 or higher, participate in at least one of the 47 sports recognized by the National Federation of State High School Association, are sponsored by their school, and serve as a role model and leader in their school and community. Should they be selected as the Louisiana honorees, they will compete on the national level against 98 other state nominees. Kaleb is the son of Kenneth and Delilah McDowell of Ventress. Jenna is the daughter of Scott and Emily Smith of Ventress. Ryan Morel (8th grade) finished in the top 20 at the Battlefield XC Festival in Port Hudson. Ryan finished 15th with a 13:24 for the challenging two mile course! 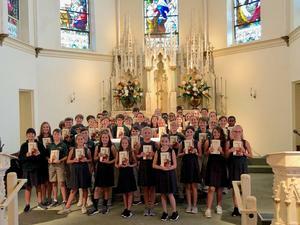 This morning our 6th grade students received their Bibles during our Blessing of the Bibles Mass! Congratulations! Please click on the heading of this announcement to access the 2018 High School Summer Reading and Math Requirements. There is also an insert placed with your child(ren)'s report card that is being mailed home. Please call the high school office if you have any questions. Jenna Smith, a junior at Catholic of Pointe Coupee, finished 3rd in the 3200 at the LHSAA State Track and Field Meet on Friday, May 4th! Jenna ran one of her fastest times ever in the two mile event with a 12:53! Catholic Selects Poetry Contest Winners! To be or not to be? That is the question at Catholic of Pointe Coupee. Rachael Bergeron (5th), Emily LaGrone (7th), Andrew Bonaventure (9th) and Maggie Lambert (12th) are the winners of Catholic of Pointe Coupee’s Poetry Contest. Students in grades 5th-12th were asked to write a poem addressing the topic What a Beautiful World…Or Not. Out of the hundreds of submissions, a panel of local judges chose a winner for each division (5th/6th, 7th/8th, 9th-12th) and an overall winner. The divisional winners, Rachel, Emily and Andrew, each received $100. Maggie was chosen as the overall winner and received an iPad. The prizes were generously donated by the contest’s sponsor, Herbie J. Thorpe, LLC.